From left, Robin Ward of Medline; Chasse Conque, director of athletics, Little Rock Department of Athletics; Sherrye McBryde, executive director of Komen Arkansas; University of Arkansas at Little Rock student athletes and staff; and UAMS Chancellor Dan Rahn, M.D., pose for a group photo with the $5,000 prize from Medline, which will be donated to Komen Arkansas. 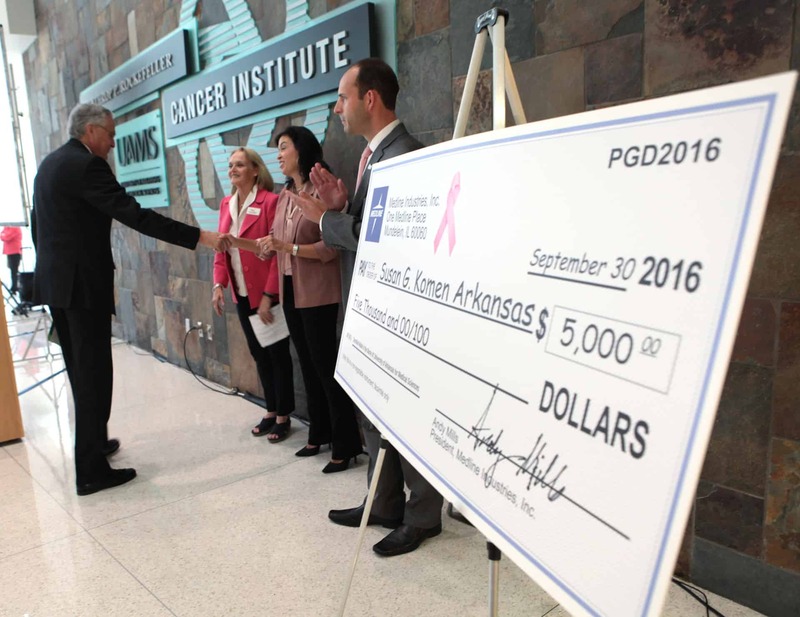 Sept. 30, 2016 | Sept. 30, 2016 | Thanks to the support of thousands of online voters, the University of Arkansas for Medical Sciences (UAMS) and the Little Rock Trojans today won $5,000 for breast cancer research in the national Medline Pink Glove Dance video competition. 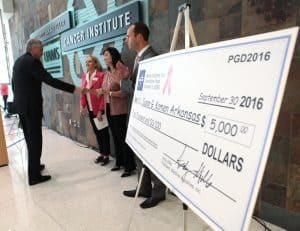 The $5,000 prize was presented by Robin Ward of Medline to UAMS Chancellor Dan Rahn, M.D., and Chasse Conque, director of athletics, Little Rock Department of Athletics, at a news conference at the UAMS Winthrop P. Rockefeller Cancer Institute. 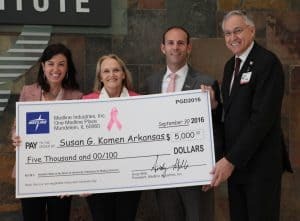 As part of the contest, the prize is donated to a breast cancer charity chosen by UAMS — the Arkansas Affiliate of Susan G. Komen. From left, Robin Ward of Medline; Sherrye McBryde, executive director of Komen Arkansas; Chasse Conque, director of athletics, Little Rock Department of Athletics; and UAMS Chancellor Dan Rahn, M.D., are pictured with the $5,000 prize from Medline. 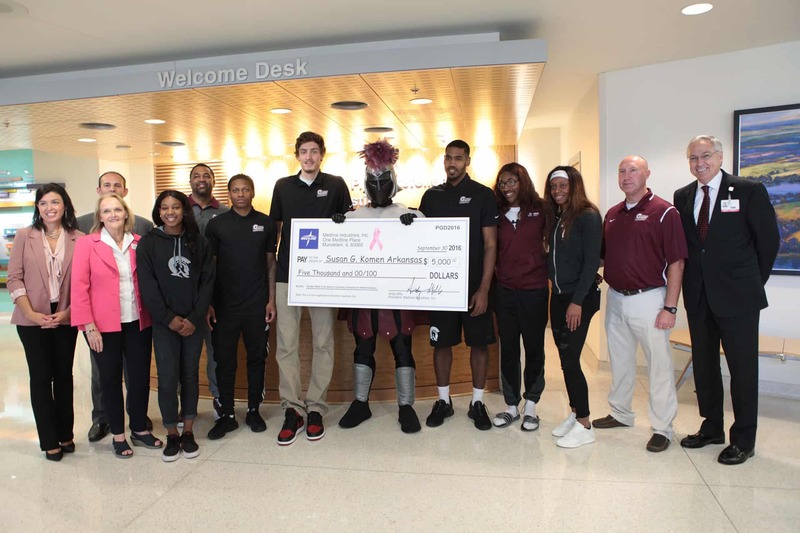 UAMS and the Little Rock Trojans partnered to produce the breast cancer awareness video that featured more than 100 UAMS employees and members of the Little Rock Trojans men’s and women’s basketball teams wearing pink surgical gloves and attire and dancing to “Shut up and Dance” by Walk the Moon. Media personalities from the local ABC, CBS, NBC and Fox affiliates also put on their dancing shoes to join the action. Visit www.pinkglovedance.com to view UAMS’ winning video. The video received 16,925 online votes to finish second in the large-bed category. This marks the second time UAMS has won in the Pink Glove Dance contest, taking first place in 2014 in the non-health care organization category, which included universities. The $10,000 prize money that year was donated to the 20th Century Club, which provides free housing to cancer patients who have to leave their hometown for treatment. 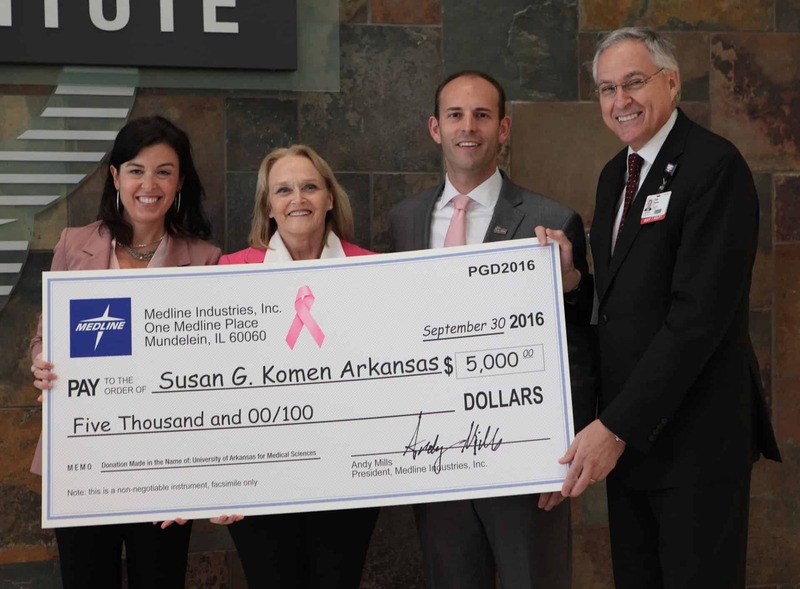 UAMS Chancellor Dan Rahn, M.D., shakes hands with Robin Ward of Medline at a check presentation Sept. 30 while Sherrye McBryde, executive director of Komen Arkansas, left, and Chasse Conque, director of athletics, Little Rock Department of Athletics, look on. Sherrye McBryde, executive director of Komen Arkansas, was there to accept the donation. The competition received video submissions from 29 hospitals, nursing homes, schools and other organizations throughout the United States and Canada. Entries are divided into three categories, with each category’s total vote-getter earning a $10,000 prize for their charity of choice. The overall vote-getter received an additional $5,000 for their charity of choice. The competition dates to 2009 when Illinois-based Medline Industries Inc., which manufactures and distributes health care supplies, turned everyday exam gloves from green to pink and launched an aggressive breast cancer education campaign to help make detection exams less intimidating and remind nurses about the importance of creating a comfortable, friendly and open dialogue with their patients. A few years later, Medline created the Pink Glove Dance video competition to celebrate hope for a cure and honor all who have been affected by the disease. The competition has inspired more than 1,000 dance videos and raised nearly $2.5 million for breast cancer prevention and free mammograms for women in need through the National Breast Cancer Foundation and other charitable organizations across the country.